For how advanced technology is getting, sometimes it feels like we add extra bells and whistles to the very things we mean to streamline. 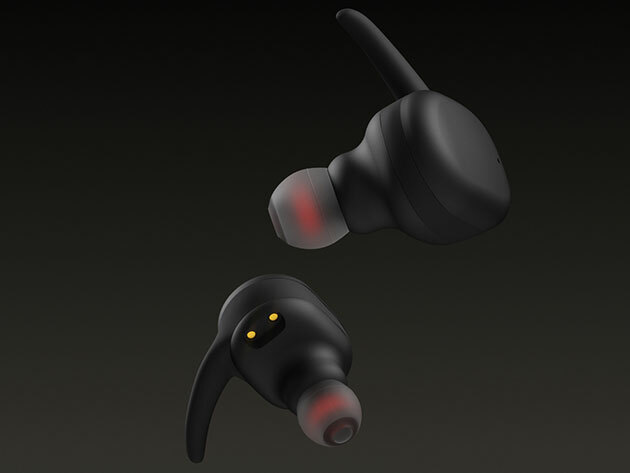 Here's an example: "wireless" earbuds. How many have you used that include extra fittings, secret wires, heavy buttons and who knows what else — when you don't really need them at all? Luckily, there are these Cresuer Touchwave True Wireless Bluetooth Earbuds — they're a perfect example of minimalism that works, delivering powerful, clear audio without tacking on vestigial parts to the design. These ergonomic earbuds feature Bluetooth 4.1 and CVC Noise Cancellation for non-skip, crisp sound. Plus, the design is totally streamlined for ease of use — meaning there's no confusing, complex buttons or extra weight. Instead, these earbuds just feature the latest in impressive sound technology in an uncluttered, lightweight design. You can change songs or answer calls with just a simple tap — plus the earbuds stay firmly in place during hard workouts with three different-sized ear tips to customize your fit, and sweat resistance to ensure they stay fully functional. Listen to music for up to three hours off a single charge, or up to 12 hours when using the charging box — plus, you can charge the buds up to four full times on the go. Usually, these Cresuer Touchwave True Wireless Bluetooth Earbuds are $99.99, but you can get them here for $39.99.